This study quantifies a year’s worth of mathematics learning in South Africa (0.3 standard deviations) and uses this measure to develop empirically-calibrated learning trajectories. Two main findings are, (1) only the top 16% of South African Grade 3 children are performing at an appropriate Grade 3 level. (2) The learning gap between the poorest 60% of students and the wealthiest 20% of students is approximately three Grade-levels in Grade 3, growing to four Grade-levels by Grade 9. The paper concludes by arguing that the later in life we attempt to repair early learning deficits in mathematics, the costlier the remediation becomes. Few would argue that the state of mathematics education in South Africa is something other than dire. This belief is widespread among academic researchers and those in civil society, and is also strongly supported by a host of local and international assessments of mathematical achievement extending back to at least 1995 (Howie & Hughes, 1998; Reddy, 2006; Fleisch, 2008; Spaull, 2013; Taylor et al., 2013). Many of these studies, and particularly those that focus on mathematics, have identified that students acquire learning deficits early on in their schooling careers and that these backlogs are the root cause of underperformance in later years. They argue that any attempts to raise students’ mathematical proficiency must first address these deficits if they are to be successful (Taylor et al., 2003). The present study adds further evidence to this body of work by using nationally representative data to provide some indication of the true size and scope of these learning deficits. In South Africa, research in this area has generally focussed on in-depth localized studies of student workbooks and classroom observation (Ensor et al., 2009). For some examples, Carnoy et al. (2012) observe mathematics learning in Grade 6 classrooms from 60 schools in one South African province (North West) and compare these classrooms to 60 schools in neighbouring Botswana. On a smaller scale, Venkat & Naidoo (2012) focus on 10 primary schools in Gauteng and analyse coherence for conceptual learning in a Grade 2 numeracy lesson. Similarly Schollar (2008) conducted interviews and classroom observations as well as analysed a large sample of learner scripts to determine the development (or lack thereof) of mathematical concepts through the Grades. 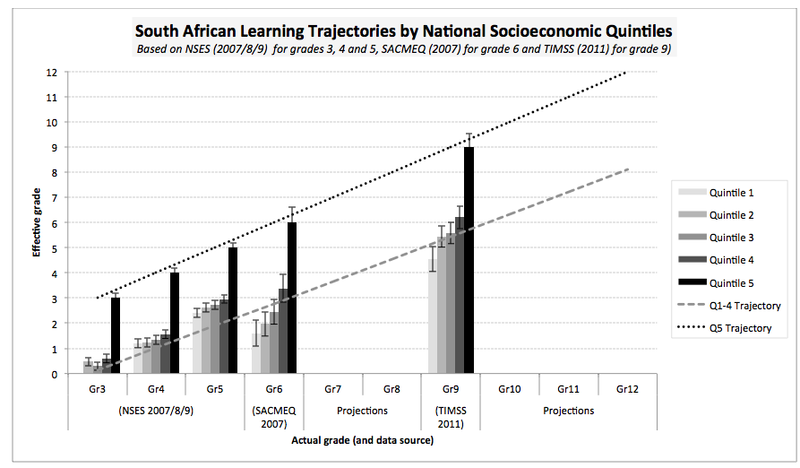 How large are learning deficits in South Africa and how are they distributed in the student population? Do learning deficits grow, shrink or remain unchanged as students progress to higher Grades? To answer these questions we analyse four nationally representative datasets of mathematics achievement, namely: (1) the Systemic Evaluation 2007 (Grade 3), (2) the National School Effectiveness Study 2007/8/9 (Grade 3, 4 and 5), (3) the Southern and Eastern African Consortium for Monitoring Educational Quality (SACMEQ) 2007 (Grade 6), (4) and the Trends in International Mathematics and Science Study (TIMSS) 2011 (Grade 9). “At all levels investigated by [The President’s Education Initiative], the conceptual knowledge of students is well below that expected at the respective Grades. Furthermore, because students are infrequently required to engage with tasks at any but the most elementary cognitive level, the development of higher order skills is stunted” (Taylor & Vinjevold, 1999, p. 231). “Phase I concluded that the fundamental cause of poor learner performance across our education system was a failure to extend the ability of learners from counting to true calculating in their primary schooling. All more complex mathematics depends, in the first instance, on an instinctive understanding of place value within the base-10 number system, combined with an ability to readily perform basic calculations and see numeric relationships … Learners are routinely promoted from one Grade to the next without having mastered the content and foundational competences of preceding Grades, resulting in a large cognitive backlog that progressively inhibits the acquisition of more complex competencies. The consequence is that every class has become, in effect, a ‘multi-Grade’ class in which there is a very large range of learner abilities and this makes it very difficult, or even impossible, to consistently teach to the required assessment standards for any particular Grade. Mathematics, however, is an hierarchical subject in which the development of increasingly complex cognitive abilities at each succeeding level is dependent on the progressive and cumulative mastery of its conceptual frameworks, starting with the absolutely fundamental basics of place value (the base-10 number system) and the four operations (calculation)” (Schollar, 2008, p. 1). To provide an alternative measure of performance, we provide two examples of no-language items in NSES and show when students answer the question correctly – i.e. in Grade 3, Grade 4, Grade 5 or not by the end of Grade 5. Given that one needs to follow the same students from Grade 3 to 5 we limit the sample here to the panel sample of NSES students (8383 students). Figure 3 below shows a simple question testing two and three digit addition with no carrying. This is within the Grade 3 curriculum which states that students should be able to “perform calculations using the appropriate symbols to solve problems involving addition of whole numbers with at least three digits.” Although this is a Grade 3 level item and contains no language content, only 20% of Quintile 1-4 students could answer this correctly in Grade 3, with the proportion in Quintile 5 being twice as high (42%) but still low. While there is evidently some learning taking place in Grade 4 and 5, more than 40% of Quintile 1-4 children still could not answer this Grade 3 level problem at the end of Grade 5. In Quintile 5 this figure was only 22%. 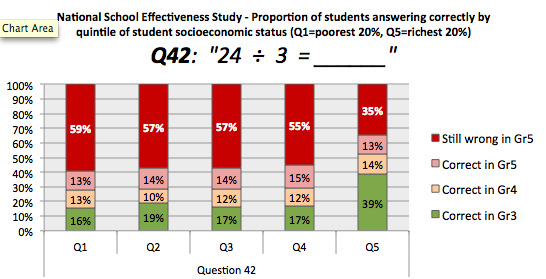 Figure 4 below shows a similar situation where the vast majority of Grade 3 children cannot answer this Grade 3 level problem. While some children learn the skill in Grade 4 or 5, the majority of children still cannot answer this problem at the end of Grade 5, despite it being set at the Grade 3 level. While the previous sections have identified the proportion of students that are not operating at a Grade 3 level, they do not provide much guidance in terms of learning trajectories into later Grades. The figures above show that some students are only learning part of the Grade 3 curriculum in either Grade 4 or Grade 5 and that many never seem to acquire these skills. However one cannot say to what extent they are also acquiring Grade 4 level skills in Grade 4 and Grade 5 level skills in Grade 5, although this is unlikely. This is because the NSES test was set at a Grade 3 level with only a small number of questions set at the Grade 4 level. One could use SACMEQ (Grade 6) and TIMSS (Grade 9) as measures of mathematical proficiency at higher levels, but these tests are not calibrated to be comparable to each other, or to earlier tests like the NSES. This is problematic since learning trajectories require data points distributed across the full range of educational phases which are comparable to each other both in terms of the content tested and the difficulty level of the tests. One alternative method to partially overcome the lack of inter-survey comparability is to measure the size of learning deficits in each data set using intra-survey benchmarks. 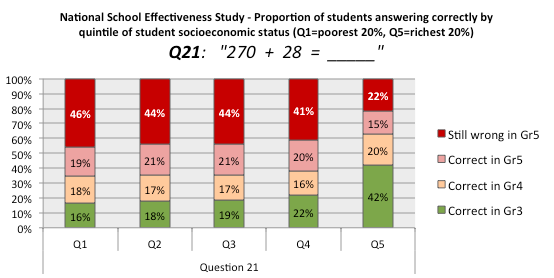 Applying the above method we calculate the difference in average achievement between Quintiles 1 (poorest 20% of students) and quintile 5 (wealthiest 20% of students) for the different surveys and then convert these into a common standard-deviation metric. The difference between quintiles 1 and 5 is 28 percentage points in NSES Grade 3, 130 SACMEQ points in Grade 6, and 122 TIMSS points in Grade 9. These different metrics are not directly comparable and there is no simple way of equating the scores. Consequently we convert the differences into within-survey standard deviations and then, using the 0.3 standard deviation benchmark as one year of learning, one can say that this difference was equal to 4 Grade-levels in Grade 3 (NSES), 4.4 Grade-levels in Grade 6 (SACMEQ) and 4.7 Grade-levels in Grade 9 (TIMSS). Lewin (2007) provides a useful conceptual model for the trajectory needed to reach a particular goal – in this case matric (Grade 12). He refers to an ‘on-track-line’ and an ‘off-track-line’ where the off-track-line is any line below the on-track-line. In the present example, the on-track-line is calibrated to be equal to the average performance of Quintile 5 students. To illustrate the above in a graph, we set the average Quintile 5 achievement to be equal to the Grade-appropriate benchmark such that the learning trajectory of these students are on the “on-track” trajectory and will reach matric (Grade 12) performing at roughly a Grade 12 level. We then calculate the difference between this ‘benchmark performance’ and the average performance of Quintiles 1, 2, 3 and 4 and then convert this difference into Grade-level equivalents using 0.3 standard deviations as equal to one Grade-level of learning. In doing so, we essentially create a learning trajectory spanning from Grade 3 (NSES) to Grade 9 (TIMSS) with linear projections for those Grades where we do not have data (Grade 7, 8, 10, 11 and 12). The exact figures for all calculations are provided in the online appendix. Figure 6 below shows the likely learning trajectories of the average student in each quintile of student socioeconomic status. Figure 6 shows that the average student in Quintile 1, 2 and 3 is functioning at approximately three Grade-levels lower than the Quintile 5 benchmark in Grades 3, 4, 5 and 6. Observing average performance by quintile in Grade 9 shows that the difference between Quintile 1, 2 and 3 students and Quintile 5 students (the benchmark) has now grown to more than four Grade-levels. If it is assumed that Quintile 5 students in Grade 9 are functioning at roughly a Grade 9 level, then Quintile 1 and 2 students are functioning at roughly a Grade 4.5 level in Grade 9. The trajectory lines, one for Quintile 5 and one for the average of Quintiles 1-4, show that in Grade 3 there already exist large differences in performance (approximately three Grade-levels) and that by the time children enter Grade 9 this gap in performance has grown to about four Grade-levels. The linear trend in performance between these two groups suggests that if the same number of students in Quintiles 1-4 in Grade 9 continued in schooling until Grade 12 (i.e. no drop out between these two periods) they would be functioning at approximately 4.9 Grade levels lower than their Quintile 5 counterparts in Grade 12 (1.5 standard deviations lower). Returning to Lewin’s (2007) notion of an “on-track” progress line, perhaps the most important conclusion arising from this conceptual framework is that any performance below the “on-track” line creates an increasing gradient of expectation as the pupil moves into higher grades. This expectation is what is required by the curriculum to reach the goal (passing the grade 12 exam, for example) relative to where the student is at the present. As students’ learning deficits grow, the gradient of what needs to be achieved to reach the goal then progressively steepens to the point where it enters what Lewin (2007, p. 7) refers to as a ‘Zone of Improbable Progress.’ For example, the improvement that is required to bring the average Grade 9 Quintile 1 student in South Africa up to the required benchmark by Grade 12 is unrealistic given that they are performing at roughly a Grade 5 level in Grade 9. By contrast, the gradient of achievement required to bring the average Quintile 1 Grade 3 pupil up to the required benchmark by matric is slightly more manageable. The clear conclusion arising from this analysis is that intervening early to correct and prevent learning deficits is the only sustainable approach to raising average achievement in under-performing schools. What we would add to this conclusion is that the root cause of these weak educational outcomes is that children are acquiring debilitating learning deficits early on in their schooling careers and that these remain with them as they progress through school. Because they do not master elementary numeracy and literacy skills in the foundation and intermediate phases, they are precluded from further learning and engaging fully with the Grade-appropriate curriculum, in spite of being enrolled in school. Lewin (2007, p. 10) refers to these children as ‘silently excluded’ since they are enrolled and attending school but learning little. Importantly, these children are precluded from further learning, not because of any inherent deficiency in their abilities or aptitudes, but rather because of the systematic and widespread failure of the South African education system to offer these students sustained and meaningful learning opportunities. Indeed, many children from poorer backgrounds have both the ability and the desire to succeed, and when provided with meaningful learning and remediation opportunities, do in fact succeed (see Spaull et al, 2012 for an example). The clear policy recommendation which proceeds from these findings confirms what is becoming increasingly accepted, that any intervention to improve learning in South Africa needs to intervene as early as possible. Given South Africa’s egregiously high levels of inequality, it should come as no surprise that poor children in South Africa find themselves at a nexus of disadvantage, experiencing a lack of social, emotional and cognitive stimulation in early childhood. These children then enter a primary school system that is unable to equip them with the skills needed to succeed in life, let alone to remediate the large learning deficits they have already accumulated to date. “Policies that seek to remedy deficits incurred in early years are much more costly than early investments wisely made, and do not restore lost capacities even when large costs are incurred. The later in life we attempt to repair early deficits, the costlier the remediation becomes” (Heckman, 2000, p. 5).